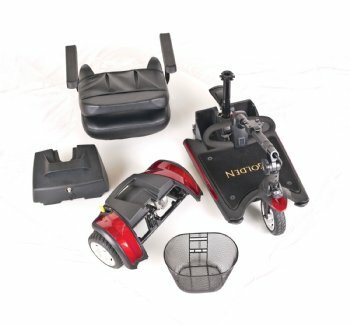 The Buzzaround XL features the sleekest design and smoothest disassembly of any compact scooter available today, with more footroom! The Buzzaround XL is 3" longer than our popular Buzzaround Lite to give users more footroom for a day full of travels, while still maneuvering well in tight indoor spaces. Featuring a Delta Tiller for comfortable hand placement as a standard feature, the Buzzaround XL has a plush 17"x16" black vinyl stadium seat with height and width adjustable armrests. 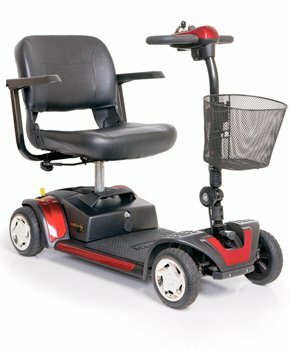 Designed with a battery charging port located conveniently under the tiller for easy charging access, the Buzzaround Lite also features snap on shroud panels in Red and Blue for an easy change of appearance.